You cant escape the inevitable crises that will face you throughout your lifetime. Whether its health problems, emotional issues, career challenges, gut-wrenching losses, or other failures, these experiences can destroy your morale and lead you into despair. Some crises may be a result of your own choices, while others may be completely out of your control. Whatever the source, there is a lasting solution that comes to you free of charge from above: Gods amazing grace. Experience real-life stories of others who discover they are not alone and that relief is within their grasp. See how devastating afflictions can be overcome through faith in Jesus and His love, mercy, and grace. Learn how Gods grace transforms lives and leads you into enduring and rewarding Christian service. Be inspired to encourage others who are suffering but cannot seek help on their own. Read these undeniable, modern-day examples of Gods loving grace and its transformative power, and discover that God is always present in your time of need. Fred Sievert started his career as a teacher, later entered the insurance business, and retired in 2007 as president of New York Life Insurance Company, a Fortune 100 corporation. Following his retirement at age fifty-nine, Fred attended Yale Divinity School and was awarded a masters degree in 2011. In his career, Fred enjoyed many successes but also had to deal with much stress, many challenges, and even some serious setbacks. Through it all, he credits his success to a reliance on daily prayer, the guidance of the Holy Spirit, and his relationship with Jesus Christ. Fred has had many nonfiction essays and articles published in the past, most often about his own providential and life-changing encounters with God. In 2014, he published his first book, God Revealed: Revisit Your Past to Enrich Your Future. He views his thirty-five-year business career as a mere prologue to what God is calling him to do todaywrite and speak about his faith. Throughout his adult life, Fred has been active in his church and has served in numerous lay leadership positions. He and his wife, Susan, have five grown children and three granddaughters and reside in East Falmouth, Massachusetts. The ultimate measure of Christianity (or any religion) should be whether it helps human beings live meaningful liveseven in the face of tragedy. 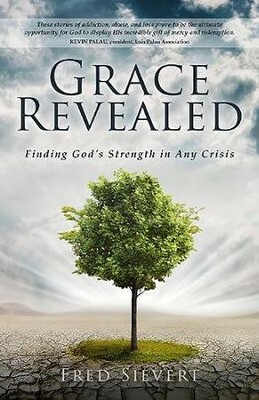 In Grace Revealed, Fred Sievert has collected nineteen stories of humans from a wide spectrum of society and Christian traditions who have discovered the transforming grace of God in crises. These stories remind us that Gods grace is not principally a theological construct or a lofty sermon, but the reality of God in our livesa reality that helps us live meaningfully, even when we have been devastated by life. Grace Revealed, Fred shares peoples stories of suffering, addiction, abuse, and loss, which prove to be the ultimate opportunity for God to display His incredible gift of mercy and redemption. These stories will inspire you to look at your own life and see just how powerful Gods grace really is! Much hope can be found in the amazing stories of the Bible, but they happened so long ago that it can be difficult to relate to the circumstances and people. God has not stopped creating amazing stories in the lives of those who cry out to Him, but the stories are rarely shared and even more rarely shared in an accessible style and format that can bring hope, healing, and transformation to people in crisis today. Grace Revealed does exactly that. With insightful background on todays struggles, thoughtful reflections, and helpful biblical references, Sievert weaves these amazing contemporary stories of Gods grace into an uplifting and easy-to-read tapestry of hope, healing, and transformation for those struggling with lifes toughest challenges. In Sieverts book, grace is not a theological concept or a religious term. Grace is the mode of Gods presence as experienced and expressed by flesh-and-blood people; it is a reality pulsating with life, bearing as many faces as there are human lives and situations and taking on as many forms as there are sufferings and delights, defeats, and victories. In Grace Revealed, you will hear many grateful voices giving their best to sing their ode to grace. It is common in recommending a new publication to refer to the book as a real "page-turner," suggesting that once begun, the reader will not be able to put it down. But because I loved the narratives in Grace Revealed, I occasionally had to put it down. The stories were as painful as they were personal, the revelations as raw as they were revealing. I came to care about these people, and my caring demanded not only my attention but my time. As a pastor, I am in the "grace business," believing that good things really do happen when people cry out for it and accept it. I can picture them singing the words of an old Christian hymn, "I love to tell the story; It did so much for me." Because it did. And with Freds help, these men and women in crisis have now told their inspiring stories. Fred Sievert has made the biblical concepts of grace, forgiveness, and healing come vividly alive through these real-life experiences of people and their journeys from confusion, pain, and despair to hope, joy, and new life. One cannot come away from Grace Revealed untouched by the way God individually and creatively works in peoples lives. Freds ability to incorporate Scripture, commentary, and the opportunity for personal reflection will leave readers feeling both challenged and inspired to find ways in which Gods grace touches them. This book will offer encouragement not only to those of deep faith, but, more importantly, to those who question Gods love and ability to intervene. Are you stumbling under a burden of grief, anxiety, or guilt and wondering if you dare hope in the gospels promise that "nothing will be impossible with God"? Fred Sieverts inspiring new book will introduce you to scores of folks who have faced crises like yours and found again and again that "you cannot fall farther than God can catch you." Are you puzzling over strangely beautiful but ambiguous intimations of consolation and hope and wondering whether to trust these as whispers of Gods assurance or to dismiss them as meaningless daydreams? As you read the testimonies collected here, youll find yourself whispering, "Gosh, thats just what happened to me!" again and again. This work will be a gift to youth leaders, and group leaders will find this book a wonderful conversation starter for gatherings of all ages. Faithful Christians will value this book as a source of daily devotionals. Spiritual seekers will be deeply grateful for the guidance and company of fellow pilgrims on the way. Once again, Fred Sievert shows us how to take the most defining choices of Christianity seriously. These stories and discussions of strong episodes of ego, forgiveness, redemption, and love trace the arc of authentic seeking. Guidance from biblical sources, psychology, and theology deepens the analysis further. Fred Sievert has hit another home run! Grace is Gods unmerited favor, and each of these miraculous stories outlined in Grace Revealed is shining proof of this. With God, "anything is possible." This book is a treasure of stirring stories of personal crisis and Christian transformation. Each persons voice is unique yet universalany open-hearted person will find himself or herself in these stories. The book is beautifully structured for group or personal study: smartly organized around common crises, clear questions for group and personal reflection, and suggested Scripture for memorization. I especially recommend this book for those who are self-conscious or even critical of talking about the reality of God in daily life. Talking about Gods activity in ones lifetestimonyis not "weird" or "self-involved." Rather, it is a crucial dimension of real faith. This book shows how testimony honors God, strengthens those in crisis, and helps othersincluding us, the readers. Fred Sievert is on a mission to demonstrate the grace, mercy, and power of God, and he does a masterful job in this second book of his. I found it thoughtful, emotional, inspiring, motivating, educational, informative, theologically and biblically sound, and presenting enlightening research. Grace Revealed is a powerful and memorable book to which many will relate, providing sound advice to those in pain, who "hurt," are helping those who "hurt," or want to understand a way to help. When I finished, I sat quietly in awe of the message, what people have endured, and how, with Gods help, they turned their lives around. Grace Revealed is far more than a theoretical discussion of Graceit is a workbook for everyone who experiences pain, addiction, fear, or resentment. In other words, it is vitally relevant to each of us. Fred Sievert combines a pastors knowledge of the Bible with real-world trauma to see how grace heals and restores fallen spirits, whether by their own action or abuse from others. It is a message of hope and lovethe pure love of Christ. Read it to be inspired. Read it to find grace in your own life. We are all playing the game of "You Bet Your Life." You can believe what you like, but you must accept the consequences. In Grace Revealed, after years of misfortune and pain, men and women write about how they came to bet their lives on Jesus. Their stories are both amazing and transformative. I'm the author/artist and I want to review Grace Revealed: Finding God's Strength in Any Crisis.